Metrodata ATM Switching DSU products are a 2-port ATM switch which can perform ATM speed and interface conversion, allowing the connection of ATM devices operating at different speeds, or alternatively the interconnection of ATM devices via leased line services of different speeds. 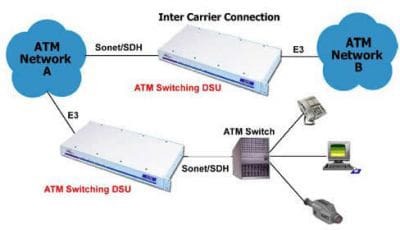 Most ATM switches and network devices are designed primarily for the American market and are equipped with SONET or DS3 interfaces. In Europe, with its E1, E2, E3, E4 and SDH services, ATM equipment must therefore be connected to unfamiliar and unsupported interfaces. The Metrodata ATM switching DSU solves this problem by performing both speed and interface conversion at an economic price. The ATM switching DSU has two different ATM interfaces. Cell traffic received at these interfaces is analysed for errors, idle cells are deleted and valid traffic is then forwarded to the ATM cell buffer. When bandwidth is available traffic is extracted from the ATM cell buffer and transmitted out of the other interface. This ATM cell buffer permits the two interfaces to operate at different speeds. If the ATM cell buffer becomes full, then cells are discarded until space becomes available. If there is no traffic queued, the DSU transmits idle cells in lieu of traffic. The ATM switching DSU has built in diagnostic loops which segment the link and assist in locating device, cabling or network faults. Extensive performance monitoring statistics are also gathered and stored for 24 hours. This provides a substantial database for assessing the performance of the network, which can be used to identify alarms, errors or data loss. Front panel LEDs also give indication of major and minor alarms. The default configuration is sufficient to get most installations applications operational, making this a truly plug and play device. Configuration can be performed via a menu driven console port, or via an integrated LM1100 SNMP enabler port which offers substantial Telnet and SNMP capability. Using fibre optics these products extend the operating distance for an STM-1/OC-3 interface to 5km using multimode fibre, or to either 30km or 70km using singlemode fibre. Despite these quoted maximum operating distances, specific installations may only operate over lower distances due to the variations in losses of different types of fibre cable, the use of connecting fibre cables, or patch panels. When operating over 50% of the maximum distances it is advisable to calculate all fibre optic connector and cable losses and compare these with the fibre optic loss budget specified for this product. As standard fibre ports are supplied with SC connectors and operate at a nominal wavelength of 1300nm. Other wavelengths are available on request, e.g. 850nm, 1550nm, 1550/1300 WDM. Other connector options are also available on request, e.g. ST, FC.